During an appearance on Late Show, hosted by David Letterman, Johnny Depp talked about a near-death experience he had while filming the upcoming The Lone Ranger, which opens July 3, 2013. Depp plays Tonto in the film and spent quite a bit of time on horseback for his role. However, he recounted one take when he was galloping and his saddle slipped. He fell off under the beautiful pinto pony he was riding and saw the hooves coming towards his face as he hit the ground. “My horse that I was on decided to jump a couple of these little obstacles,” Johnny explained. “When we came down, the saddle slipped and I went to the left and (lost) the reins, somehow I had the wherewithal to grab his mane – all very calm for some reason, I figured fear would kick in, but it didn’t. I saw in front of my eyes these very muscular horse legs and the striations of muscles moving, this kind of death machine. One word popped into my head – hooves!” Johnny added that the only thing that saved him from being killed was the horse, who lifted up his front feet and jumped over Depp to avoid hurting him. Almost a Christopher Reeves situation! Could have lost another talent too soon. I have no intentions of watching this movie though. Good horsey. he should be a body guard for Johnny Depp after saving his life. the horse should be a body guard for Johnny Depp after saving his life. Thank god! It would be so so SO sad to hear that Johnny Depp would be out of work because of that injury. 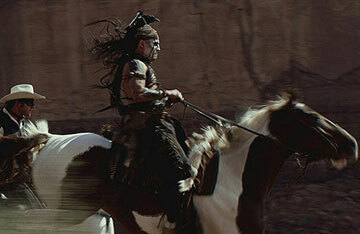 Can’t wait for Lone Ranger also – trailer looks like it would be amazing!